Our double award-winning game! Creative Child Magazine chose this game as their 2012 Top Toy of the ..
Great for those long car trips, our Deluxe Cherry Tic-Tac-Toe comes with 5 red and 5 blue pegs. 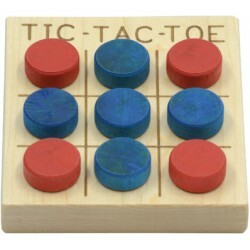 The ..
Our Small Maple Tic-Tac-Toe board comes with blue and red pegs. Crafted from locally sourced, respon..
We call our train engine themed Tic-Tac-Toe board Tic-Tac-Toot! Cut as a train engine silhouette and..